The ruling by the Supreme Court of Monaco of 16 February 2009 constitutes a miscarriage of justice, breaching articles 6, 8 and 13 of the European Convention of Human Rights. Consequently, the oldest Constitutional Court in the world has, de facto, relegated the Monegasque legal order to among the latest in Europe for recognising the principle of State responsibility due to jurisdictional activity. Excerpts of the Supreme Court’s 2008-04 judgement; excerpts of the demands; excerpts of the request before the ECHR; comments. Appeal on the legal basis of Article 90-A-20 of the Constitution of the Principality of Monaco. and pronounced in the presence of Mr Jacques RAYBAUD, Crown Prosecutor, on the sixteenth February two thousand and nine, by Mr Michel ROGER, member assisted by Ms Béatrice BARDY, Senior Registrar, Chevalier de l’Ordre de Saint Charles. The Minister of State’s lawyer, Maître Joëlle PASTOR-BENSA has been the lawyer of one of the victims in this affair, Mr David Fristedt. The lawyer was one of the called witnesses. Incredible but true! His Excellency the Ministre of State of Monaco, Michel ROGER – one of the judges of the Supreme Court. * the internal regulations of the Bar Association of the Principality of Monaco setting the rules of professional ethics for the Monaco Bar. None of the called witnesses was allowed to come and testify. Claire NOTARI – one of the witnesses whose hearing was refused by the Supreme Court, which preferred to let her work as a bailiff during the very same trial before the Supreme Court, despite her being involved in the affair at stake. Incredible! 71. In its ruling of 16 February 2009, the Supreme Court dismissed the appeal lodged by Mrs. Fristedt ordering the latter to pay all costs. 72. The Supreme Court noted that, according to article 90 A 2 of the Monegasque Constitution, it was making a definitive ruling in a constitutional case on actions for damages related to a violation of the freedoms and rights enshrined in Volume III of the Constitution and which are not mentioned in paragraph B of this article. 73. By a particularly restricted interpretation of its own competence, the Supreme Court considered that it “is clear from this legislation that, outside the framework where a law is in question, the damage to the freedoms and rights consecrated by Volume III of the Constitution must result from a patently illegal action, i.e. by actions taken by an administrative authority, taken outside any proceedings or any law, but excluding acts by the judiciary or acts by an individual” (our emphasis). 1. Every person is entitled to respect for his/her private and family life, home and correspondence. 2. There may be interference by a public authority in the exercise of this right only if this interference is decreed by the law and it is a measure which, in a democratic society, is necessary for national security, for the police, for the economic well-being of the nation, for the protection of law and order and for preventing criminal offences, for the protection of health or morale, or for the protection of the rights and freedoms of anyone else. 76. 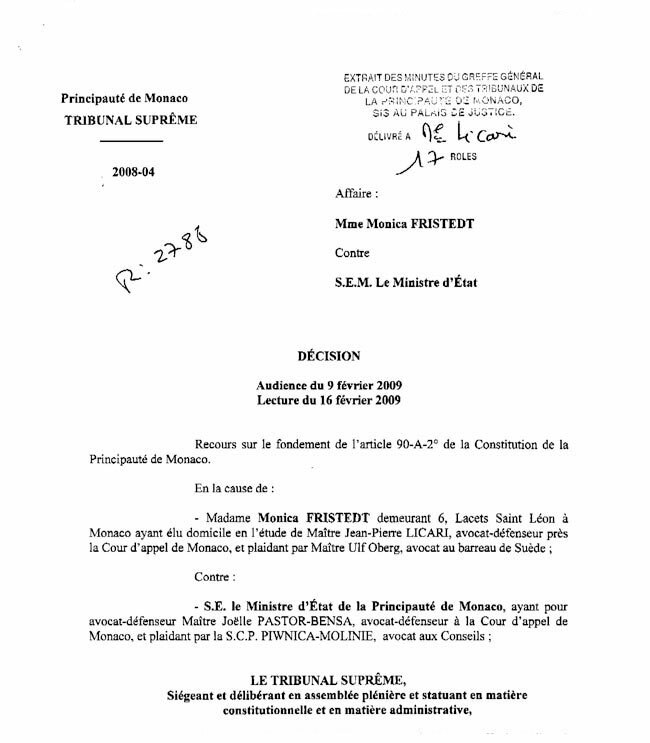 The initial interference in Mrs. Fristedt’s private and family life, her home and correspondence occurred by the unilateral order by the Vice President of the Court of First Instance of the Principality of Monaco of 21 July 2004, and by its immediate enforcement on 27 July 2004 through the bailiff, Maître Marie-Thérèse Escaut-Marquet, the wife of Maître Escaut, Mrs. Shahzada’s defending counsel. Maître Didier ESCAUT against whom the Chief Prosecutor Jacques Raybaud has refused to lay charges, here present at the trial, fully confident in his not having to fear any action from the judicial authorities. 77. Through this order, Mrs Fristedt has been evicted from her own home, on no legal grounds whatsoever. Her private archives, as well as all her furniture and personal belongings with which she had filled her home, have been put to the disposal of MadamShahzada with whom she was in judicial conflict, and this before the active help of the Monegasque justice, the Monegasque police, and of any Monegasque state lawyers. 122. Consequently, the explicit, implicit and persistent refusals by the Monégasque authorities to investigate or terminate this case have continued to this day. They are not amenable to any remedy. 123. In other words, nobody in any position of responsibility whatsoever in the Principality of Monaco appears willing to accept his/her due responsibilities in ensuring the protection of Mrs. Fristedt’s property and her private life. For a Principality within which prosperity relies very largely on these principles, essential in any rule of law, this is unacceptable. 139. Consequently, the oldest Constitutional Court in the world has, de facto, relegated the Monegasque legal order to among the latest in Europe for recognising the principle of State responsibility due to jurisdictional activity. 140. The facts are that all member States of the European Union now own this principle of State responsibility because of jurisdictional activity. All of them own this principle for jurisdictional rulings themselves, and therefore they are ignoring the rules of law applicable on their sovereign territory if fundamental rights are breached (see the conclusions of the Advocate General, Philippe Léger, of the European Court of Justice in the Köbler case, C-224/01, Rec. p. I-10239, point 77 et seq.). 141. Regarding the findings of the Supreme Court that acts by the judiciary or acts by an individual fall outside of its remit in accordance with article 90 A 2 of the Monegasque Constitution, Mrs. Fristedt was unable to find an effective remedy before the Court of First Instance of Monaco in order to receive compensation for those instances where her fundamental rights were breached by this same jurisdiction. 142. The facts are that this jurisdiction had previously, on two occasions, without any legal basis for this purpose, deprived Mrs. Fristedt of her own home and the peaceful enjoyment of the property located thereby. 143. The Court of First Instance of Monaco did not therefore fulfil the conditions of impartiality as required by article 6 of the Convention, in order to judge its own errors in law which led to the breaches of Mrs. Fristedt’s fundamental rights. Owing to the very small size of the Principality, there are no other jurisdictions to which this case could be referred so as to ensure impartial judgement. 144. In order therefore to compel an appellant to initiate these steps before the same court which is at the source of the breaches of his/her fundamental rights is equivalent to forcing him/her to resort to procedural devices, for which the chances of success appear non-existent, in order to petition for a review of his case. This goes beyond the “normal” usage of the internal remedies required by article 35 § 1 of the Convention. 145. In other words, the ruling by the Supreme Court of Monaco of 16 February 2009 constitutes a miscarriage of justice, breaching articles 6, 8 and 13 of the Convention. The Monegasque authorities have failed in their obligation to conduct in-depth and effective investigations to lead to the identification and punishment of those responsible for breaching Mrs. Fristedt’s fundamental rights. 151. However, although article 8 of the Convention is intended essentially to protect the individual against arbitrary interference by the authorities, it does not simply order the State to refrain from similar interferences: to this negative commitment can be added positive obligations inherent to true respect for private or family life. They may require adoption of measures targeting respect for private life in the mutual relations between individuals (see judgment Hannover v. Germany, no. 59320/00, § 57, ECHR 2004-VI). 152. If this principle is imposed on all contracting parties to the Convention in order to protect the private life of a member of the House of Grimaldi, who reigns as sovereign in the Principality of Monaco, it is imposed with equal force on the Principality itself with a view to protecting citizens and residents thereof. 193. 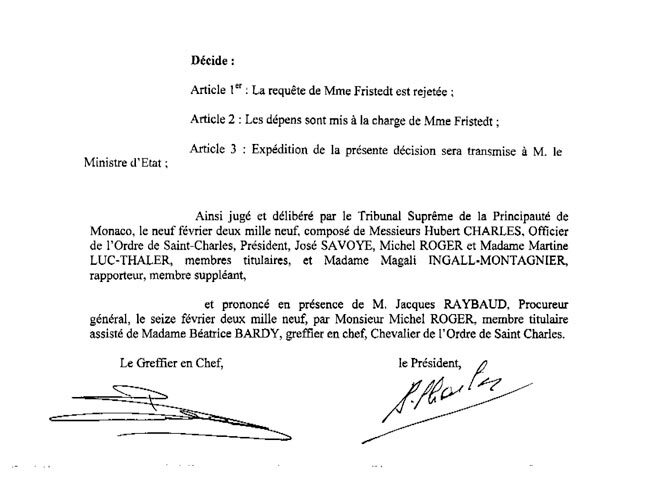 In a letter dated 22 August 2007, sent to the Prosecutor General, Mrs. Annie Brunet-Fuster, Mrs. Fristedt asked for access to the case file, intending to obtain details of the actions which had been taken in response to repeated complaints by the Fristedt family to the Monegasque authorities. 194. In a letter dated 10 October 2007 to the President of the Court of First Instance of the Principality of Monaco, Brigitte Gambarini, Mrs. Fristedt asked to have due access to the court files concerning her, in order to obtain copies of all the documents in these files. 195. However, these requests were not met and, to this day, remain unanswered and the Supreme Court has refused to rule on this matter. 198. Mrs. Fristedt claims that the repeated refused access to the administrative and court files concerning her case, in order to be able to use the appropriate remedies before the competent courts, is in itself a breach of article 6 of the Convention. On the Chief Prosecutor before the Supreme Court, click here. The following list of attached documents to the request before the ECHR has not yet been translated. It is, however, followed by important information in English. 2. Mandat de advokat Ida Otken Eriksson. 3. Engagement d’hébergement à titre gratuit de Madame Monica Fristedt du 2 juin 2003 au profit de Madame Shahzada. 5. Lettre adressée par Madame Monica Fristedt à la Direction de la Sûreté Publique en date du 13 mai 2004, et reçue le 17 suivant, informant les autorités monégasques qu’elle avait révoqué l’engagement d’hébergement qu’elle avait pris au profit de son ex belle-fille, Madame Shahzada. 6. L’ordonnance de Madame le Premier Vice-Président du Tribunal de Première Instance de la Principauté de Monaco du 21 juillet 2004, autorisant Madame Shahzada à résider seule au domicile de Madame Fristedt. 7. Note manuscrite de Madame Corinne Métivier, le clerc assermenté suppléant Maître Marie-Thérèse Escaut-Marquet, griffonnée sur un papier vierge, indiquant les noms de Maître Escaut et Maître Escaut-Marquet comme commanditaires de l’exécution de l’ordonnance du 21 juillet 2004. 8. 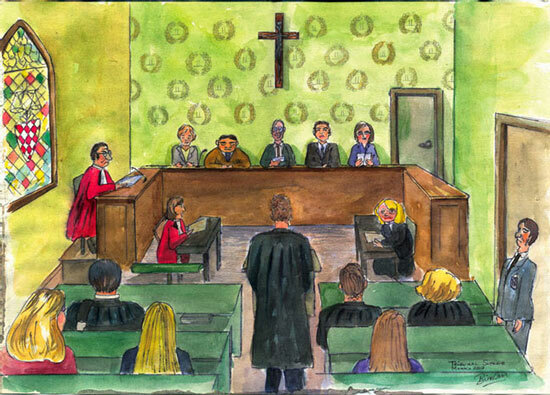 “Procès-Verbal de Constat” du 27 juillet 2004 de Maître Escaut-Marquet, huissier de justice, enregistré le 12 août suivant, établissant pour le compte de Madame Shahzada, cliente de son mari avocat-défenseur, Maître Escaut, un inventaire non contradictoire du contenu de l’appartement de Madame Fristedt, laissant ainsi à la seule discrétion de Madame Shahzada « d’indiquer ce qui lui appartenait et ce qui appartenait à Madame Fristedt”, en exécution de l’ordonnance de Madame le Premier Vice-Président du Tribunal de Première Instance du 21 juillet 2004. 9. Plainte de Madame Fristedt du le 7 août 2004 contre X pour avoir confisqué ses biens, sans ordonnance à cet effet, et les avoir mis à la disposition d’autrui. 10. Ordonnance de référé en date du 9 septembre 2004 de Madame Dorato-Chicouras, Premier Juge faisant fonction de Président du Tribunal de première instance. 11. Lettre du Procureur Général de la Principauté de Monaco du 16 mai 2006, informant Madame Fristedt que sa plainte du 18 octobre 2004 a “fait l’objet d’un classement sans suite au motif suivant : .infraction non caractérisée”. 12. Procès-verbal de constat du 2 décembre 2004 de Maître Notari, huissier de justice. 13. Arrêt du Tribunal de Première Instance de Stockholm du 11 mai 2006, par lequel le mariage entre Monsieur David Fristedt et Madame Shahzada a été dissous. 18. Lettre de advokat Ulf Öberg du 30 Octobre 2007, adressée au nouveau Bâtonnier du Barreau de Monaco, Maître Rémy Brugnetti. 20. Décision du Tribunal Suprême du 16 février 2009. 21. Jugement du Tribunal de Première Instance du 12 mai 2005, déboutant Madame Charlotte Shahzada de sa demande en divorce introduite contre Monsieur David Fristedt. 22. Ordonnance du 20 octobre 2004 de Madame la Juge Bitar-Ghanem, Juge au Tribunal de Première Instance, condamnant Monsieur David Fristedt par défaut à verser une somme de 4 000 € à titre de pension alimentaire à Madame Shahzada. 23. Requête rectificative de Madame Fristedt du 14 janvier 2008 devant le Tribunal Suprême de la Principauté de Monaco. 24. Contre-requête du Ministre d’État du 25 février 2008 devant le Tribunal Suprême de la Principauté de Monaco. 25. Réplique de Madame Fristedt devant le Tribunal Suprême de la Principauté de Monaco. 26. Duplique du Ministre d’État du 30 avril 2008 devant le Tribunal Suprême de la Principauté de Monaco. 27. Mémoire en réponse de Madame Fristedt aux moyens nouveaux de l’État de Monaco du 25 juin 2008 devant le Tribunal Suprême de la Principauté de Monaco. 28. Observations du Ministre d’État du 30 juillet 2008 devant le Tribunal Suprême de la Principauté de Monaco. 29. Lettre de Madame Fristedt du 3 août 2004 à l’attention de Monsieur le Conseiller du Gouvernement pour l’Intérieur. 30. Plainte de Madame Fristedt du 14 octobre 2008 pour violation du secret médical, de son domicile et de sa vie privée et familiale. 31. Lettre de Madame Fristedt du 31 juillet 2004 à Monsieur le Président du Tribunal de Première Instance Philippe Narmino, attirant l’attention sur le fait que ses œuvres d’art, ses dossiers confidentiels et sensibles ainsi que des bijoux lui appartenant se trouvaient dans son domicile mis à la disposition de son ex belle-fille par la justice monégasque. 32. Plainte de Madame Fristedt du 18 octobre 2004, adressée à Monsieur le Procureur Général Daniel Serdet. 33. Plainte de Madame Fristedt du 25 juin 2008 contre Maître Didier Escaut, avocat-défenseur, Maître Christophe Sosso, avocat, et Maître Escaut-Marquet, huissier de justice, au Procureur Général, Monsieur Jacques Raybaud, pour instruction. 34. Lettre du Tribunal de Première Instance de la Principauté de Monaco, du 4 août 2004, par lequel le Président du Tribunal de Première Instance a fait connaître à Madame Fristedt qu’il n’était pas habilité à répondre à son courrier du 31 juillet 2004. 35. Lettre de Monsieur Philippe Narmino, Directeur des services judiciaires du 23 août 2006 par lequel il a informé Madame Fristedt, que «les violations de la Constitution et abus de pouvoirs que vous alléguez n’apparaissaient pas caractérisées ». 36. Lettre de advokat Ulf Öberg du 20 juin 2007 au Directeur des services judiciaires, Monsieur Philippe Narmino. 37. Lettre de Monsieur Philippe Narmino, Directeur des services judiciaires, du 24 juillet 2007, indiquant qu’il n’avait pas la qualité pour engager l’État monégasque et que, en tant que responsable de l’administration de la justice, il n’était en tout état de cause pas enclin à réserver une suite favorable à la requête de Madame Fristedt. 38. Lettre de Madame Fristedt, du 22 Septembre 2005 adressée à Son Altesse Sérénissime, le Prince Souverain Albert II. 39. Lettre de Madame Fristedt, du 31 mars 2006 adressée à Son Altesse Sérénissime, le Prince Souverain Albert II. 40. Lettre de Madame Fristedt, du 5 mars 2007 adressée à Son Altesse Sérénissime, le Prince Souverain Albert II. 41. Lettre de advokat Ulf Öberg, du 17 août 2007, adressée à Son Altesse Sérénissime, le Prince Souverain Albert II. 42. Lettre de advokat Ulf Öberg, du 12 juin 2009, adressée à Son Altesse Sérénissime, le Prince Souverain Albert II. 43. Demande d’accès au dossier du 22 août 2007 de Madame Fristedt auprès du Directeur des services judiciaires. 44. Lettre de advokat Ulf Öberg du 22 août 2007 adressée à Madame le Procureur Général Annie Brunet-Fuster. 45. Lettre de advokat Ulf Öberg du 10 octobre 2007 à Madame le Président du Tribunal de Première Instance de la Principauté de Monaco Brigitte Gambarini. 46. Lettre du 25 octobre 2007 de Monsieur Georges Lisimachio, Chef de Cabinet de Son Altesse Sérénissime le Prince Souverain Albert II, indiquant qu’il lui était impossible pour Son Altesse Sérénissime, s’agissant de décisions de justice et de leur exécution, d’intervenir, de quelque manière que ce soit dans le dossier, en l’état du principe de l’indépendance des juges. The premeditation of the actions of the challenged persons will be demonstrated through the incredible “staples, marker pen and IT-bug Affair”. It will be given a chance for the new chief prosecutor to deal with it once and for all before its publication here, in accordance with the declaration of Mr Thomas Hammarberg, of the Council of Europe, published within two weeks after Monaco’s Supreme Court’s judgement of rejection.